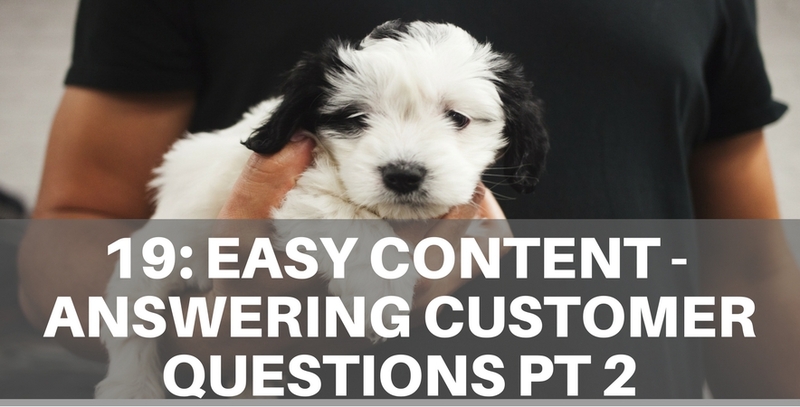 In this episode, we discuss how you can create content by answering customers questions. This is part 2 of 2, we went on for quite some time on this topic and have split it into two episodes. It's probably the easiest way to create relevant content for your site and we think we have outlined a whole list of ways you can extrapolate out the ideas to be unique and interesting. Sample Content Spreadsheet to capture all your cusomer questions and group them: Make a copy and download. Darryl: my great white shark now what types of content could I produce from for this. Edmund: Yeah take it down to the pool, so you think about this you just this little unboxing / installing video you've got a video that you put onto YouTube you got a video that sits in the product section) of the website and also at the support section plus you got a PDF a little ebook version of that as well you can send out to customers as part of your support you know uhmm it has multiple uses. Darryl: because you’ll be forced to write 500 words or 800 words for each post and that would be great but we want to challenge you to take that a step further and that answering questions doesn't just fill in blogs or Facebook posts it gives you ways or It gives you an understand how to create video, it gives you ideas to make better content for static pages on your site and it really helps you understand what your customers are after.